For 50 years, we have been working for and alongside people with epilepsy and our commitment to them and their families is stronger than ever. Our mission remains the same and our volunteer leadership is made up of people who have epilepsy and who love someone with epilepsy. We’re active in the business of supporting the RIGHTS of people with epilepsy, improving access to specialty and supportive CARE, and offering programs to improve and save LIVES, while proudly investing more in RESEARCH for new therapies and cures. While we are proud of our accomplishments and current priorities, we know there is so much more to be done. Together, let’s pursue End Epilepsy on behalf of each individual affected and on behalf of our community as a whole. Together with you — your stories, action and walk to raise awareness and resources — we will do better. And because of that people with epilepsy will do better. That’s why we’re taking the Walk to End Epilepsy bicoastal and in between. It’s surprising to most people that 1 in 26 will be affected by epilepsy, but it’s reassuring to know that 26 in 26 (everyone!) can make a difference for people with epilepsy. The Walk to End Epilepsy provides a platform to take action and promote even greater awareness and action. 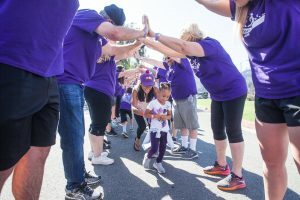 Of all the Walks to End Epilepsy across the country, the two largest are on the West Coast in L.A. in February 2019 and on the East Coast in D.C. in April 2019, and others are planned in other parts of the country in 2018 and 2019. 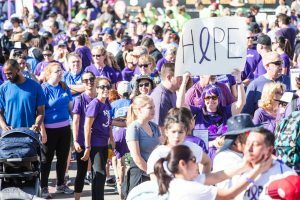 We hope all walks will become larger than the walk in L.A., because that will be good for people with epilepsy! The Walk to End Epilepsy is a platform to engage the community affected by epilepsy as well as epilepsy specialists and other healthcare professionals, corporate partners and the general public in bringing awareness to, confronting and solving a chronic brain disorder that affects 3.4 million people in the USA — and can affect any of us. The epilepsies affect 3.4 million individuals and their families in the USA. But epilepsy doesn’t stop there. Epilepsy affects 150,000 more new families each year. Seizures including SUDEP and status epilepticus (a prolonged seizure) take about 22,000 to 42,000 lives each year. There are many different epilepsy syndromes which are characterized by a variety of seizures which affect people differently. A seizure is an abnormal electrical discharge in the brain. The epilepsies have different causes including birth injury, genetics, head trauma, brain infections, brain malformations, tumors and strokes and some unknown causes. There are many treatments — medications, dietary therapies, surgeries, devices, and lifestyle modifications — that can often control seizures. There are no cures. The epilepsies are more common than most people realize; and affect men and women of all ages, races, creeds and socio-economic backgrounds. Anyone can have a seizure. We’re in this together. Even though epilepsy is often invisible, there is an emotional, social, mental and/or financial toll that affects each family differently. Take time to learn the deeper story. A person is more than their epilepsy. Some people with epilepsy lead full lives and thrive. Others face challenges in all aspects of life. Let’s not stereotype epilepsy or the person with epilepsy. Epilepsy is not a joke or a punchline or an excuse to bully. Seizures aren’t funny. Let’s take it seriously. Programs and research for cures in epilepsy is seriously underfunded. Let’s take action. Your story of epilepsy is like gold in the fight to End Epilepsy. Personal stories of epilepsy are the best way to help people understand the epilepsies — a complex spectrum of brain disorders or diseases. We hear moving stories about the varying degrees of physical, economic and psychosocial impact on families. We hear stories about children who are bullied and lose friends. Adults with epilepsy share about unfairness and lost jobs and relationships. We wish the stories of injury and death just weren’t true, but they are. We are also privileged to hear stories of bravery and resilience through the medical gauntlet — and many other gauntlets — and to withstand loss while still dreaming and achieving big dreams. Each story of trial and triumph fuels and inspires our fight to End Epilepsy. Create a Walk Team and share your own story of epilepsy. Create a Walk Team in honor or memory of a loved one or friend with epilepsy. Create a Walk Team in support of a group of people affected by epilepsy — for example, families diagnosed with a rare epilepsy, families at risk, students with epilepsy, the elderly with epilepsy, newly diagnosed families and more. Create a Walk Team because — whether you know it or not, everyone knows someone with epilepsy.